In a large sauté pan, cook garlic, onion, celery and carrots until tender, about 10 minutes. Add sausage and cook until done, breaking up large chunks of sausage. Cool down. 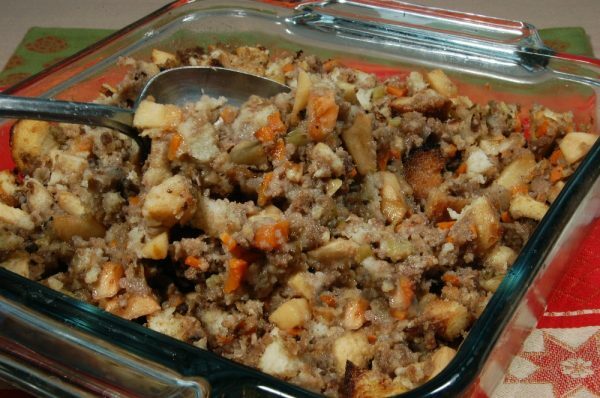 In a very large bowl, place seasoned stuffing, corn bread stuffing, walnuts and apples. Mix in the sausage and sautéed vegetables. Add pepper and salt, and slowly pour chicken broth into mix, a little at a time until stuffing is moist but not soggy. Dress turkey and place remainder of the stuffing in a casserole. Bake at 350 degrees for about 30 minutes.